This gig is a fundraiser to bring some of the international artists out to Sydney for There Goes The Neighbourhood. Inspired by this global phenomenon of gentrification, There Goes The Neighbourhood is an exhibition, film festival, workshops and publication about the politics of space happening in May at the Performance Space. The project brings together a group of local and international artists who have worked on various projects that have explored the relationship between community and space and we’re inviting them to develop these issues further in the contested local environment of Redfern. The artists involved are: Daniel Boyd, Brenda Croft, Lisa Kelly, SquatSpace, Claire Healy and Sean Cordeiro, Ned Sevil and friends (Australia), Temporary Services (USA), Jakob Jakobsen (Denmark), 16beaver (USA), Miklos Erhardt and Little Warsaw (Hungary), Michael Rakowitz (USA) and Bijari (Brazil). We will also be doing a re-enactment of Allan Kaprow’s Push and Pull: A Furniture Comedy for Hans Hofmann (with thanks to the Allan Kaprow Estate) and hosting a Gordon Matta-Clark film screening. We know January is super hectic but please come down and support us- this gig is going to be awesome! Inspired by their namesake fashion icons responsible for bringing shoulder padded style and geometric glamour to the suburbs of eighties Australia, Suzanne Grae and the Katies are a 6 piece all gal sleaze rock band based in Melbourne, Australia. It was just this spring season of 2008 that Suzanne Grae met the Katies at a discount outlet over the 50% off rack. The Katies all had their nails into the one peach power suit, and things were getting hairier than a Poison after party. However Suzanne stepped in to suggest the divvying up of the garment between the ladies, shoulder pad by pleat by precious polka dot, and the Katies could not help but come to their fashion senses. They offered to Suzanne both the peach power suit and a promise – To together form a band that would let no obstacle, not broken heels nor lack of musical ability, stand in the way. 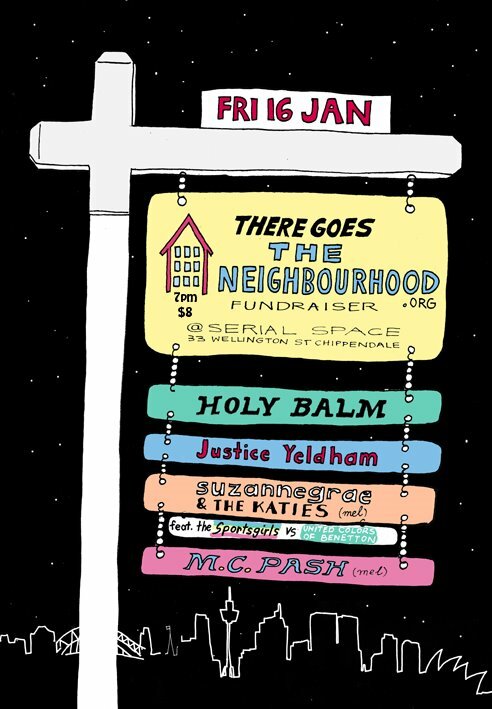 Fresh back from 3 months eating dumplings and making noise in China, catch Justice Yeldham’s first gig back in Sydney. This guy is never sticks around for long before he’s off again- so don’t miss ‘the glass guy’ himself, even if he is a pane. “What’s been described as “a trumpet player trapped in a two dimensional universe” is in fact the unique audio work of Justice Yeldham, a maverick musician with an unhealthy obsession with sheets of broken glass. By pressing his face and lips against the glass whist employing various vocal techniques ranging from throat singing to raspberries, he turns disguarded household windows into crude musical instruments. Resulting in a wide variety of cacophonous noises that are strangely controlled and oddly musical. If you like dancing under a blanket to Black Sabbath shoeless in the grass then you will love Holy Balm. Freshly back from shows in Vietnam we are proud to have this incredible female emcee up in Sydney for one show only!!! – and look out for her debut album which is about to be released! Big, huge, massive thanks to all the performers and Serial Space.